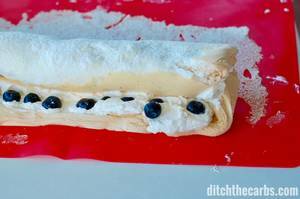 My sugar-free meringue roulade came about by accident. I have been trying for weeks to make a sugar-free pavlova that will stay crispy and not collapse, well it has been an epic fail on both counts. But what I did discover, is that a failed sugar-free pavlova makes and amazing soft rollable sugar-free meringue roulade. Traditional pavlova recipes are incredibly high in sugar. The sugar gives pavlova it’s structure and the sugar caramelises and gives the crispy texture. The meringue mixture is sugar free, so puffs up like crazy, but deflates as soon as you remove it form the oven, this is actually a good thing. Because it doesn’t go crispy (due to the lack of sugar) it is pliable and easily rolled up. 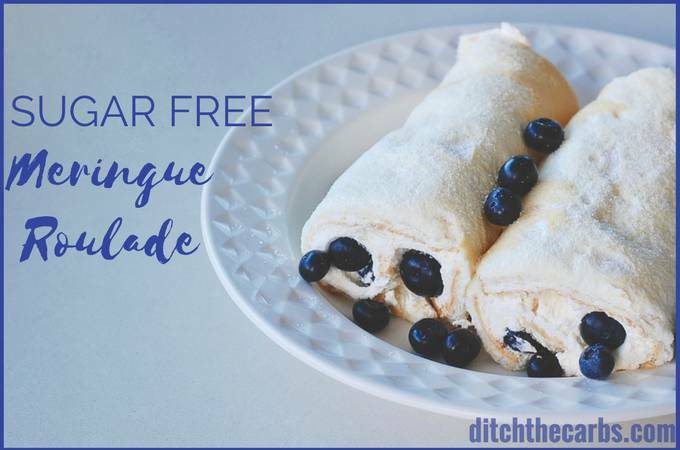 Sugar-free meringue roulade can be filled with whipped cream, sweetened cream cheese, whipped coconut cream and any berries that you like. Sprinkle some berries, cream and sweetener on top, for an easy sugar-free dessert. Why not drizzle 90% chocolate over it too, for a decadent dinner part dessert. The trick to rolling up the sugar-free meringue roulade, is to use a silicon baking sheet or baking parchment. Start at one end, and slowly roll using the silicon sheet, similar to how sushi is made. 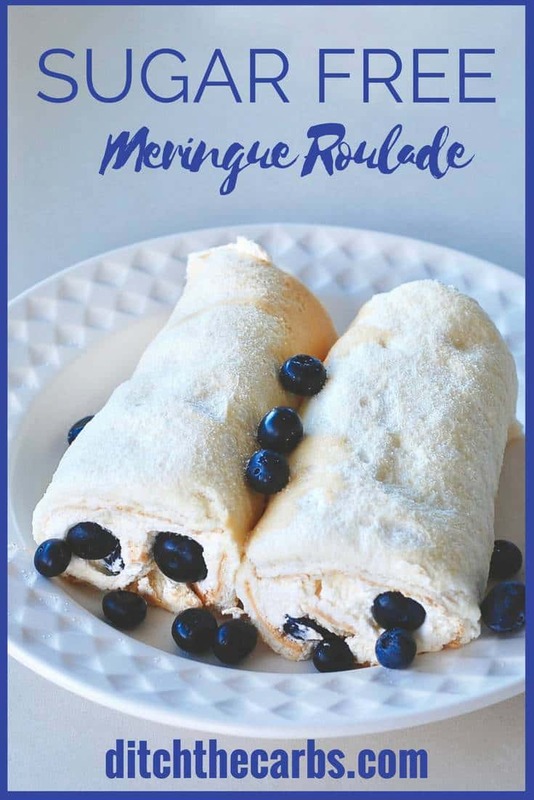 Sugar-free meringue roulade can be filled with your favourite flavoured whipped cream. How about mocha, brandy, or chocolate? Using an electric beater, whisk the egg whites and the cream of tartar until it begins to thicken. Slowly add the granulated sweetener whilst continuing to whisk to form stiff peaks. 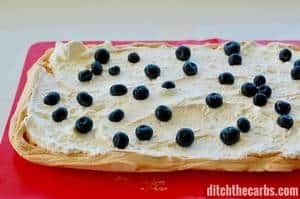 Once the sugar-free meringue is thick enough to not fall from the whisk when lifted, spread over the silicon baking sheet or baking parchment in a rectangular shape. Bake at 100C/210F for 1.5 hours. Remove form the heat and allow the meringue to cool before filling with whipped cream and berries. 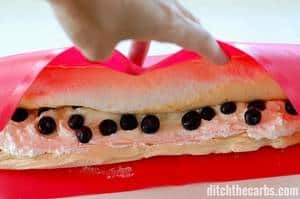 Roll the meringue into a roulade gently. Place on a serving tray and decorate with cream, berries and a little sweetener sprinkle all over. Nutrition is not given as the carbs in the sugar-free meringue roulade is almost zero. The carbs will come from what you choose to serve it with. Cream, berries, 90% chocolate. 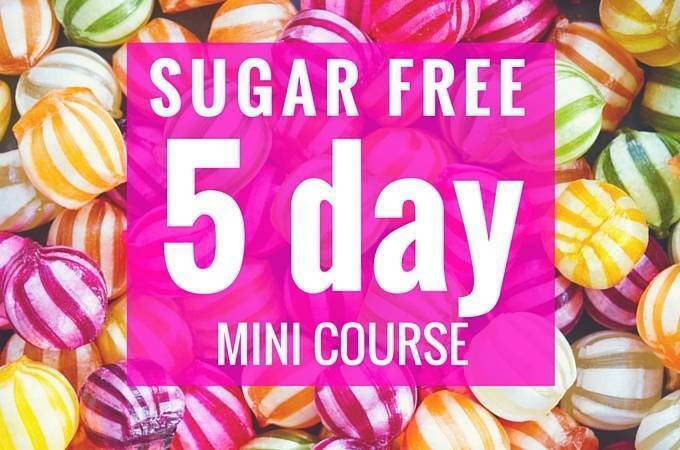 So choose your decorations according to how many carbs fit in with your lifestyle and requirements. See here for the full list of carbs in fruit. Hi, in the oven, I used parchment, will this stick? 210 f. 1 1/2 hours? It won’t stick if it is good quality baking parchment, or you can use a silicon sheet too. I’m confused is cook the temperature for this recipe correct? 100 degrees is like keep warm temp. Yes, you cook the meringue at a very low temperature for a very long time. For a pavlova, you cook at a high temperature for a very short time, then you actually turn the oven off and it remains in the warm oven for hours (I’m a kiwi so I was hooked on cooking the perfect pavlova). And yes, the strange taste is possibly the sweetener perhaps? You can add a small dash of vanilla to the egg whites. That always tastes amazing. I tried it now 3 times and it always gets crispy and breaks up. I can’t roll it at all. Any ideas what I am doing wrong? Grateful for any hints, ideas,… because my family loves the taste but it looks like a mess (broken pieces stacked on each other). Thanks! Can this be made ahead of time? Like the day before? How should I store it? Lemon curd! Definitely doing this. Hey I tried this today and it came out great, nice and marshmellowy like a pav but without the outside crunch. I’ve been doing keto for 8 months and when my 6 year old saw this he told me I was naughty for breaking my diet, he couldn’t believe that something that tasted this good was actually ok to eat. My kids loved it, husband loved it and so did I. I regularly have left over egg whites and can see this making a regular appearance on our menu. Hello another Kiwi buddy 🙂 This recipe was born because I just could not get a sugar free pavlova to go crispy, so thought how can I harness that soft quality? Voila!! A roulade was developed instead. I fold it like a sushi roll, along the longest side and it was too long for my serving plate so I cut it in half. Then when it was time to serve, I cut individual slices. Can I use honey crystals as the sweetener? Honey is still sugar, so it would no longer be low carb. It looks really good! I don’t have a sweet tooth, but the hubby will love this. Will try soon! What is the texture of the meringue part like? I’ve had pavlova, but never even heard of roulade! I’m intrigued…. It is a soft velvety sponge texture. I was so disappointed when I was trying to make pavlova then I tried to roll it into this and voila – my moment of genius. Soft, airy and light. You can flavour the whipped cream filling with lemon zest, chocolate, crushed berries etc. The possibilities are endless. D’you know, I was just thinking about how to make a sugar free roulade. DD has just made a chocolate one, and I reckon I can do yours with cocoa in it. Like Jenn, I was wondering about adding the eggs back in somehow. DD’s recipe adds back in before cooking. I feel some experimenting coming on! Do you have a recipe for a low carb silky custard? I cannot wait to try this!!!!!!!! Thanks Libby u rock!